The UK's largest co-operative society is to pay out £19.6m to customers under its profit-share dividend scheme relaunched last year. The Co-operative Group said it would pay out 1.43p for every point earned across its businesses - from its shops to travel and funeral services. The dividend scheme has more than 1.4 million members. The payout is linked directly to the firm's profits. Before the relaunch it ran a fixed-point loyalty card scheme. The Co-op said that a shopper who spent £10 a week on food in its stores during 2006 would get a dividend payment of £7.43. Meanwhile a mortgage holder with £50,000 left on their mortgage would receive £35.75. The group made pre-tax profits of £318m in 2006. "Last year was a good one for the group as a whole and, following the launch of our new membership scheme, for the first time members can reap the rewards of our success across our diverse family of businesses," said chief executive Martin Beaumont. "At a time when communities are becoming increasingly dominated by a handful of large and impersonal business, we are showing consumers that there is a better alternative, one which is ultimately owned and controlled by them." The profit-share scheme is a return to the "divi" that ceased 30 years ago - with customers paying £1 for membership. 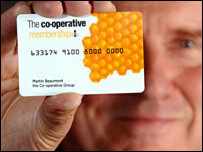 The Co-operative Group, due to merge with Rochdale's United Co-operatives at the end of July, was formed from the merger of the two largest societies, the Co-operative Wholesale Society and Co-operative Retail Services, in 2000. But its roots go back to the Rochdale Pioneers co-operative of 1844, whose founding tenets included the idea of sharing profits according to purchases. This idea developed into the "divi" or dividend, a cash-based loyalty payment which became a popular form of saving for millions of shoppers. The paper-based system was phased out by some of the larger Co-op groups in the 1960s and 70s because it was expensive to operate, but is still used by many of the more than 30 remaining independent Co-op retail societies. Co-operative retailers had a 20% share of the British grocery market in the 1950s, but have lost ground to the supermarket giants such as Tesco, Sainsbury's and Asda.